Following are a selection of some of our favourite recipes using farm fresh honey. We hope you find something to tickle your taste buds’ fancy! Some of these would be ideal gifts if you are looking for something special to make and give to someone. The sweet treats will keep for several days in the fridge and are firm enough to be boxed attractively or wrapped in cellophane and ribbon, and given as a gift. 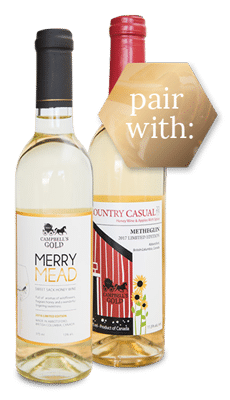 This gorgeous dessert recipe created by Chef Jason Navarra, is best complimented with our Merry Mead or the sweet Metheglin! Yields 1 galette, 8-10 portions. To make the crust: In a bowl, mix the flour and salt. Quickly incorporate the chilled cubed butter into the flour by rubbing them together between your finger tips or by using a pastry cutter. The flour/butter mixture should be sandy with pea-sized bits of butter. Using a fork or your fingers, slowly add the cold water into the bowl until just combined. Press and form the dough into a ball. Do not over-mix or knead. The dough should be damp but not moist with flecks of butter throughout. Shape the ball into a disc and wrap with plastic wrap. Allow to chill in the refrigerator for at least 2 hours. You can always prepare the dough the night before. To make the filling: Half and core the pears. Cut the halves into 3 mm – 4 mm thick slices. Mix the pear slices, honey, granulated sugar, cornstarch, cinnamon, allspice, vinegar, lemon juice, water, vanilla extract, and salt in a bowl. To make the galette: Preheat the oven to 400 F. Mix the brandy and dried currants in a bowl and allow to plump. Take the crust dough out. On a lightly floured parchment, roll out the disc to a thickness of around 4mm. Transfer to a baking sheet. Arrange the pear filling evenly on the dough, leaving 20 mm – 25 mm around the edges. Scrape and pour the thickened filling liquid from the bottom of the bowl over the pears. 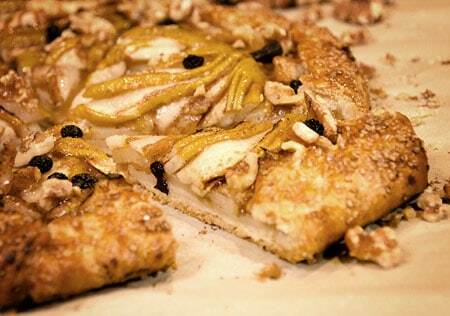 Distribute the walnuts over the galette. Fold over the edges of the crust onto the sliced pears. Brush the edges with egg wash and sprinkle generously with the demerara. Bake the galette for 30-40 minutes until the crust is deep golden and the juices begin to bubble. Allow the galette to cool for 10 minutes. Before serving, drain and scatter the plump brandied currants over the galette. 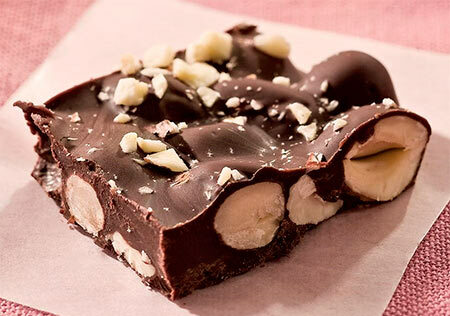 Finish with a drizzle or honey. Slice and serve warm with whipped or ice cream. To make the honey miso dressing: Add all ingredients, except the sesame oil, into a blender or food processor. Blitz together, scraping down the sides as needed. Slowly stream in the sesame oil into the running blender to emulsify. Taste and adjust seasoning. Store in the refrigerator until needed. To make the roasted vegetables: Preheat oven to 375 F. Scrub the root vegetables and peel, if desired. Keep vegetables whole or cut as needed to the same size to ensure even cooking. Place vegetables on baking pan and drizzle with olive oil. Season with salt and black pepper. Toss ensuring all are coated. 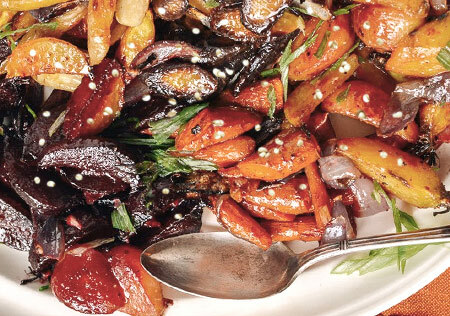 Roast vegetables for 20-30 minutes, tossing and dipping halfway. 5 minutes before vegetables are fully cooked, pull the tray from the oven. Add enough miso dressing to coat the vegetables, tossing them together to fully cover each piece of vegetable. Place back in the oven for the last 5 minutes. Serve garnished with sesame seeds and a side of lemon wedges for acidity. These marzipan-like sweets can be presented as squares, stars or other shape, if your prefer. 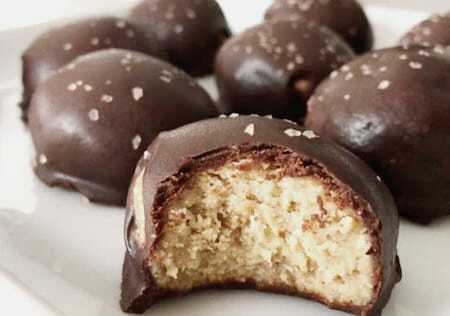 They can also be prepared without the chocolate coating. 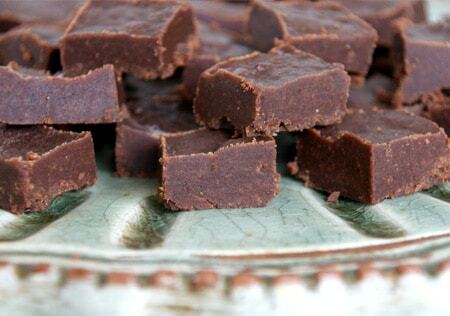 Instead of diabetic chocolate, you could use very high cocoa content dark chocolate, which has very little sugar in it.